Ariela Bohrod appeared on Show 270, recorded in March 2013, at age 17. 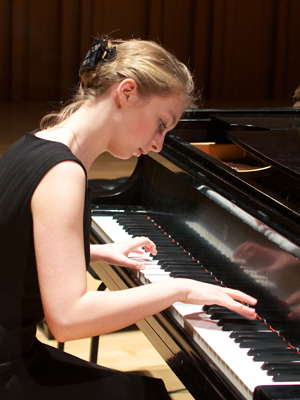 Ariela Bohrod (piano), 17, is from Madison, Wisconsin and studies with T.J. Lymenstull at the Interlochen Arts Academy. Ariela has played in various chamber groups as well as accompanying vocalists. Additionally, she has attended Interlochen Arts Camp, played in the Montecito Summer Music Festival in 2010, 2011, and 2012, and the Bowdoin International Music Festival in 2012. Ariela enjoys making do-it-yourself crafts, reading, writing, watching movies, and shopping. Ariela is a Jack Kent Cooke Young Artist.